All this being said, the $1.41 trillion in outstanding student loan debt is still a ways off from the $10.6 trillion in mortgage debt during the peak of the Great Recession. However, student debt in the U.S. is now the second largest class of debt, above credit cards. LendEDU wanted to see how millennials, the largest living generation in the world, thought the student loan debt crisis in the U.S. stacked up against other serious threats that the country will be dealing with in the coming years. 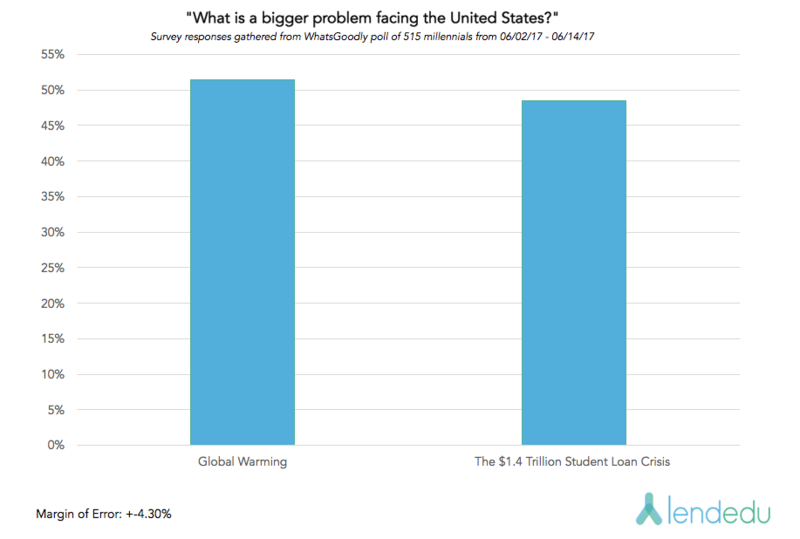 Millennials were nearly split down the middle in terms of deciding if global warming or the student loan crisis is the biggest problem facing the U.S.
250 millennials, or 48.5 percent, think the $1.41 trillion student loan crisis is a more serious issue for the U.S. than global warming is. The remaining 265 respondents, or 51.5 percent, believe global warming is a bigger threat facing this country. Considering millennial’s thoughts on global warming, this poll produced some mildly surprising results. In a poll conducted by the University of Texas at Austin in the fall of 2016, 91 percent of millennials believed climate change is occurring, the highest percentage ever. For reference, 74 percent of seniors aged 65 and older said climate change is occurring. Millennials represent the generation that most staunchly believes in global warming, and this will be the demographic that will lead the fight against climate change in the coming years. The fact that virtually half of them believe the student loan crisis is a more serious threat to the U.S. than global warming, which may wipe out entire cities, is a telling indication of the severity of this country’s educational debts. 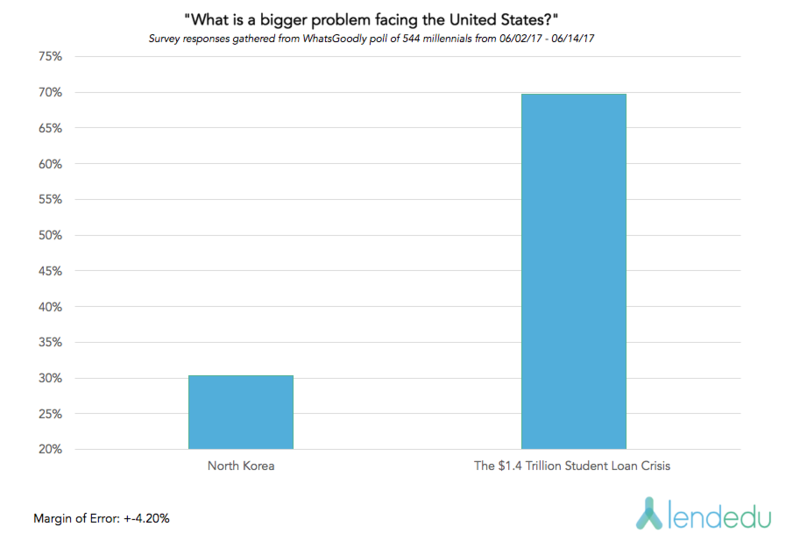 Unlike the first question regarding global warming, millennials left no doubt that they think the student loan crisis is a bigger threat to the U.S. than is North Korea. 379 participants, or 69.7 percent, think the $1.41 trillion student loan debt situation is a bigger threat than North Korea. On the other side, 165 millennials, or 30.3 percent, believe North Korea poses more of a threat than does the student loan crisis. One could make a strong argument that North Korea presents the greatest international threat to the U.S. At this point, many foreign policy experts believe it is a case of “when,” and not “if,” the North Koreans develop a long-range nuclear missile that could reach the U.S. mainland. That being said, more than two times the amount of millennials still believe the student loan crisis poses a bigger threat to the U.S. than the rogue regime of North Korea, a testament to just how serious this nation’s student loan debt crisis is.